TSAM, I learned about political science from college while I get much needed practice from the workings in the association. During my membership, I never missed meetings that were held in 2006 when I was in my first year as its member. Mr. Rinchen Tashi, then a final year Master student in English department from Loyola College was the president. The student association is confined to Madras city as the name of the organisation suggest and it was founded in 1993 by then young students in Chennai city the prominent of among whom was Mr. Tenzin Tsundue, a young English department student from Loyola College. In our freedom struggle, the Tibetan identity outside Tibet can’t be recognized without its association with His Holiness the Dalai Lama. Our identity is nil or associated with other ethnics or nationals on numerous occasions. There are several incidents of local Indians confusing us with north-east citizens or students of India or worse with Nepalese national. An unknown people asking us this kind of questions are not uncommon in colleges. “Are you from Manipur?” For some they got this question which they don’t really want or expect to receive “Are you from Nepal?” Nobody identifies us with our original identity despite more than 50 long years of struggles at world stage for the freedom of Tibetan people and nation. At one point of time while working in Sutherland Global Services, a BPO company based in Chennai my colleague asked me. “Are you from Nagaland?” I replied without pause “No, I am not from Nagaland. I am from Tibet”. In a shocking reply from the same person he asked in different tone. “Which state is it in India?” In dead shock I asked him. “How many states are there in India that starts its name with ‘T’ like Tamilnadu?” He kept pondering while myself searching in inner voice. Barring Tripura and Tamilnadu there is no other states in India that has ‘T’. The decision on Telangana was yet to come by then. He couldn’t come out with reply. I asked him then. “Have you ever heard about a country called ‘Tibet’? He replied “No”. I was disheartened that my host country that gave me everything I am having right now couldn’t even have inkling of an idea about my country. But I can forgive him for he was neither a political science student to know nor was he bothered about it. People working in BPO mostly come from engineering background and there is no college or course as such offering Political Engineering. Every colleague to whom I asked about their qualifications is engineering in one or other way. I was the only one who did political science in arts background working in BPO. Therefore, whenever any colleague asked about my qualification I would say “I did Political Engineering from MCC” and they would think deeply questioning themselves as to what kind of course is it before asking further questions and I keep laughing from inside. Those Indian friends working in call centre hardly care about politics or government. Their life is between office and their house. Having not found any state called ‘Tibet’ he asked me again “then where is it”. As internet service is 24*7 available in our office, I guided him through Google (which is not allowed by company norms and regulations for private use) and showed where Tibet is and our leader, His Holiness Dalai Lama’s pictures. The moment he saw His Holiness pictures he said “Oh this is your leader; I know and heard a lot about him”. Then my mind began to question me how come this guy didn’t know or even heard about Tibet when he heard about His Holiness the Dalai Lama. Sometimes they used to call me as Jackie Chan of the office floor and often asked this question “do you know Ku Fu” to which I used to reply “yes a little if you want to learn come out I will teach you”. During my free time, I used to tell them tragic stories about Tibet and even used to guide them through Google about Tibet, the problem between Tibet and Chinese Communist government. Little do they care except for few sympathetic words they would pour over me. Indians are very conservative in social affairs and they have very strong family relationship. They would often ask me about my family and when I told them I haven’t seen my family for more than a decade they would look at each other’s face in disbelief and say, “Tenzin, then how are you staying here? Who are sending you money to fend off yourself? Who pay your fees and all family and finance related queries. However, during my 18 months stint in Sutherland Global Service, I have made a mark about the existence of not only Tibet but its struggle for national survival. To be more specific and concrete they would now believe that any person joining there company with name ‘Tenzin’ would be a Tibetan. Samten Sangmo, our former batch mate from Chennai College once messaged me in Facebook messenger. “Hi Phuntsok, how are you? The manager of the company I was working under told me that he knows you by the name Tenzin”. Since there are so many Tenzins among Tibetans she wasn’t confirmed of which Tenzin. So the manager named Mr. Allen, under whom I served when I was working in Sutherland Global Services, showed my photo from his Facebook and was able to recognize that it was me who worked there. I can’t make mark in the company to garner their support in our cause against China, but somehow made them feel that there is an identity called “Tibetan” which is struggling to retain its past glory. Nobody says “are you from Tibet? They may say “Where are you from instead”. However, in Quscient Technology where I worked for a short stint, they know well about Tibet and even had a Tibetan student who worked there before. To a question to a senior manager who interviewed me during the interview when I replied to her query that I am from Tibet she said “Oh you are from Tibet, tell me something about your journey to India”: clearly knowing about Tibet quite well. Though it was an interview to assess my speaking level and pronunciation in English, I really loved the question of answering about my journey to India. I told the whole story in short and later was told to wait for another round of interview, the final to decide my employment. I was really happy that I was able to tell something about a Tibetan boy’s journey to India before even I got to take the floor in the office. As my thinking goes, it is important to take a self-responsibility to explain to wherever and with whomever you are to ensure your identity is not threatened at very place where you are located or staying. It is a local duty of yours as a Tibetan to look from the smallest point to see as how you can maintain the identity of Tibet. The identity and its struggle for freedom is the chief reason why there are so many associations and branches of Tibetan Youth Congress or Tibetan Women’s Association in India and elsewhere. We must individually take responsibility in parallel with your personal and professional life in retaining the identity of Tibet, regardless of H.H. the Dalai Lama and Government in exile. In particular, TYC, TWA and other organisations of Tibet including TSAM in Chennai has extra responsibility in working towards our goal. I was based in Chennai and my first experience with student political activities are learned there. My debt to this association is pricelessly valuable and I will surely make best use of political and social acumen I learned from there for any Tibet struggle related events. 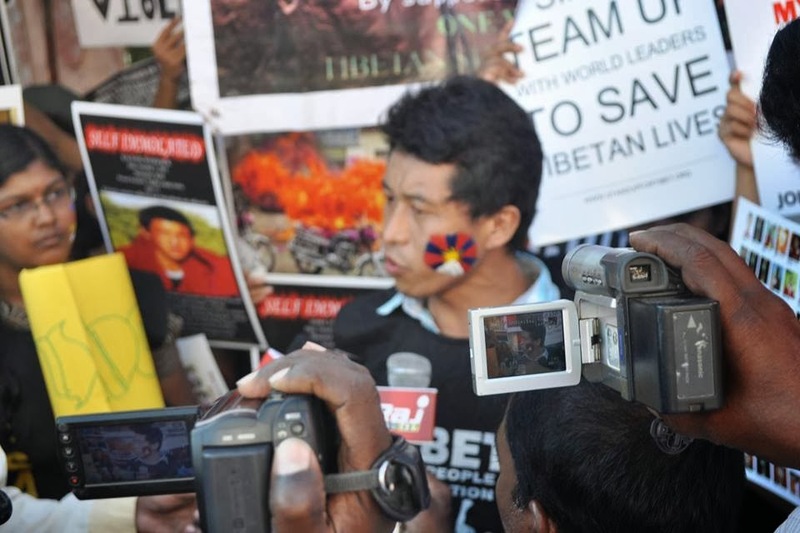 Of late, I was bit disheartened to see the dwindling nature and structure of Tibetan student’s activism in the colleges. Everyone is so bothered about their private lives that even students wouldn’t come for a meeting that were rarely held to chalk out activities for the Tibet-Identity related events. Not many of our students take serious note of their studies. To be worse many are still in the same school habit of studying namely; paging through the books by burning midnight oils during or at the time of exams. Not much of activities too are visibly seen or heard to be held. Thanks to Baroda Tibetan Students Organisation (whichever organisation you belong to), I have tracked and seen them doing great for the last two or three years taking every step possible in their disposal to highlight Tibet. At one point of time, a meeting of TSAM being held has very less attendant and the worst thing to be later known was a statement by one of the student who didn’t come for meeting. “What difference will it make if I don’t attend”. Membership to TSAM and most probably any other organisations are voluntary. TSAM attempted to make compulsory membership to Chennai students but failed. However, one must owe allegiance to our struggle wherever you are. When you are in Chennai, you work under TSAM as its member because it represents Tibetan identity in Chennai. I really am annoyed on those who didn’t join TSAM after they are done with the college admission. By refusing to join the association in TSAM (or anywhere else, be it Chandigarh, Delhi or Baroda) you are shying away from responsibility. To remind all and sundry, New Delhi and Chandigarh was once the epicentre of young student ac tivism. Bangalore has the history of once being the hotspot for student activities. Students take pride in joining the Tibetan student association to protect their identity in those days. Doing something for the association in the region or city is considered sacrosanct. More so, as I went by the old records and books that were piled in Tibetan Pavilion Library at Auroville, I was deeply surprised to see a very beautifully printed magazine of TSAM filled with photos of academic as well as political-social activities by the likes of then student leaders, Dhardon Sharling, Wangdue or Chodhar and industrious worked put up by its founders. I have no hesitation in admitting that regardless of what our first generations of Tibetan Diasporas have in their mind, the responsibility for future struggle of Tibet is thrown to us and therefore their hopes lies in us. I once heard (don’t know true or not), late Dr. Dawa Norbu, a well known professor of International Studies in JNU and a prolific writer, used to learn each word from a book keeping in mind the Chinese enemy. Words learned are like each Chinese eliminated out of Tibet. I think we must have that determination and consistency from the heart and brain of each one of us and study and struggle. The Chinese students of our age are far ahead of us in terms of their determination and I think it’s important to weigh our determination in exile in comparison to them. The clock ticks from the moment Tibet was invaded and Dalai Lama was exiled and we can’t afford to waste our resources and energies in just Facebooking, making best use of modern gadgets and roaming around or paying lakhs of rupees to unknown sources to get a way out to abroad. I am totally not against these movements of our people to foreign countries but we must have a sense of presence of nationalism which is clearly lacking these days. Political education and political cultural developments are very important for our generations. Political cultural and struggles must began from a family and therefore, it is important for the families in exile to teach and cultivate a sense of Tibetanism or Tibetan nationalism while coping with professional lives. We came to India in 1959 not to settle in India or America or Europe but with a firm promise and determination to go back and claim our land, it mustn’t be forgotten. Therefore, the responsibility of national struggles lies in every person who has a Tibetan blood. Where-ever you are. His Holiness, alone won’t be able to ship the tide of Tibetan Freedom; he must be followed, subordinated and integrated by all of us. I don’t give a damn about any other country’s policy towards Tibet as no country will act without national interest in their mind. Let us retrospect and mull where we have lacked in the past few years and bring back the lost glorious revolutionary activism of young bloods of Tibetan students in the bygones. We need to wake up; study like you may not see your books or colleges tomorrow if you don’t study today and energise yourself with a blood of Tibetan nationalism. I know that world has become too small and distracting for us to fight the Chinese imperialism but if we don’t fight who will?